It's almost time! Eight more days and school starts. We go on Tuesday to the official meet the teacher at the school. We've had coffee with her and then all the first grade teachers came to a local sno-cone place and all the incoming students were welcome to come and meet them. It was as 6pm, so a great time for sugary treats, right? lol Anyway, I wanted to get started on my teacher cards to try and build a stash. 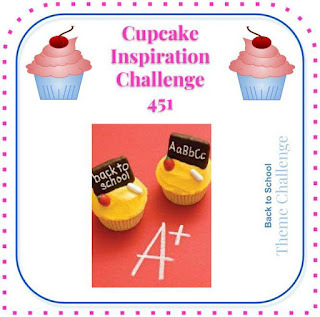 I played along with the Cupcake Inspirations challenge and the SugarPea Designs challenge. This is just darling! Love the big pencils! Thanks for sharing with us at Cupcake Inspirations!